At Deanan Gourmet Popcorn in Wylie, expansion progress has moved along substantially since our last update. At the exterior, all finish materials have been installed and openings have been prepared for the installation of storefront windows which will take place over the coming weeks. In the interior, work is focused in office areas, with the installation of plumbing fixtures, lighting and ceiling grid all taking place. Since our last update, construction has progressed along substantially at Deanan Gourmet Popcorn in Wylie. At the expansion's exterior, stone, stucco and Hardie siding are all being installed, giving the exterior its final appearance. 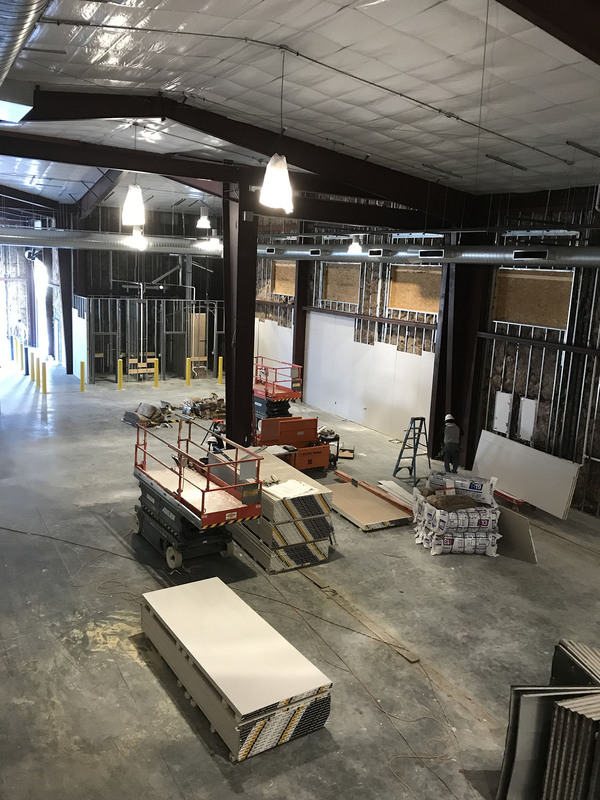 In the interior, framing along with mechanical and electrical rough-ins have been completed, and now drywall and other wall finishes are being installed throughout the facility. McCarthy Architecture is currently working with Saint Anthony Catholic Church in Wylie on a range of renovations across their church's campus. The work scope of the current project centers around an expanded sanctuary platform to bring the movement of the liturgy closer to the congregation, along with new tile floors, new pews, improved lighting, a new cast stone background for the crucifix, and a new entry canopy to provide a sheltered entry point adjacent to the main parking lot. In addition, plans are being made for an expansion of the church's administration building. 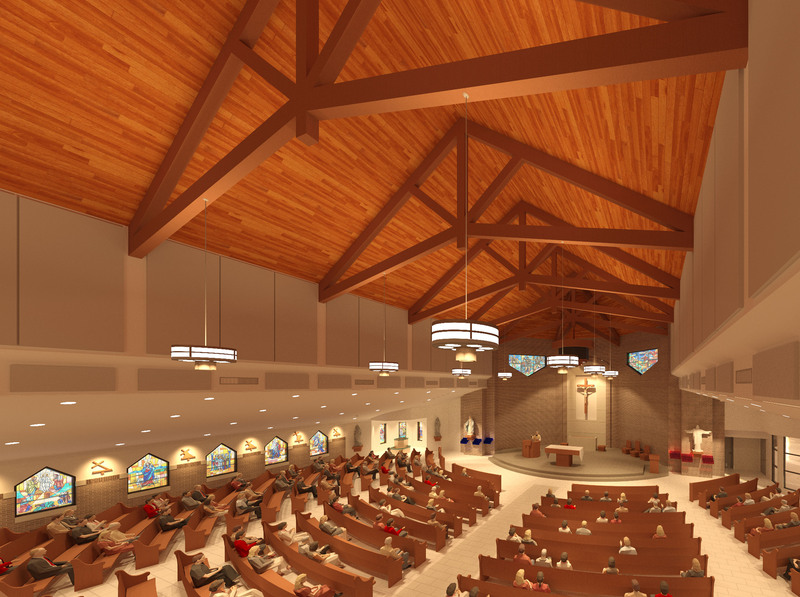 Below are some concept renderings of the church's renovated sanctuary. McCarthy Architecture is currently working with Northwest Bible Church on a renovation of their campus' gymnasium. The project's scope consists of a full gym floor replacement with a new premium playing surface to improve safety for players, along with a new reception area to facilitate security and provide a warm welcome for visitors. The gym floor replacement is already complete, and work throughout the remainder of the project is expected to finish over the coming weeks. 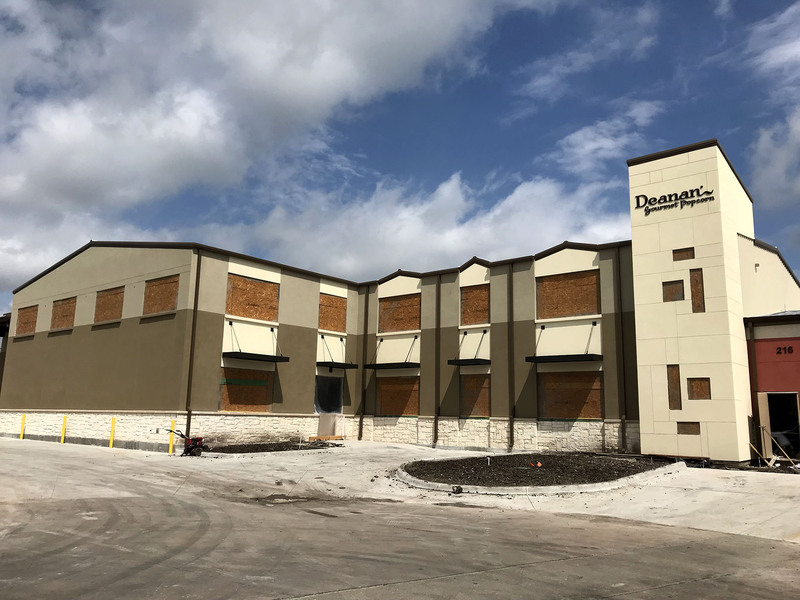 Over the last couple of weeks, construction has continued to take shape at Deanan Gourmet Popcorn's production facility in Wylie. With exterior sheathing and roof insulation/standing seam panels in place, the magnitude of the space becomes much more dominant. In addition, mechanical ductwork is currently being hung throughout the facility. Construction is contiuing to progress along at Deanan Gourmet Popcorn's production facility in Wylie. Over the past several weeks, the building's steel frame has been erected and an elevator shaft has been constructed. Presently, exterior wall framing is being installed and sheathing will be following closly behind. McCarthy Architecture is currently working with Life High School Waxahachie on an expansion of their campus into an existing adjacent building. The existing building previously served as a crossfit gym and was mostly an open shell, giving the school a blank slate for the project. This new facility will include classrooms, science and computer labs along with a reception area. Construction is progressing along quickly, with current work is centered around the installation of interior floor finishes, lay-in ceilings, and tile along corridor and restroom walls. Ultimately, this project will be the first phase of a multi-phase expansion. At the Islamic Association of Collin County's campus in Plano, construction is continuing to progress along both the north and south sides of the facility. At the north side expansion, stucco is being applied along the exterior, while gyp board and lay-in ceilings are being installed at the new classrooms. At the south side expansion, stucco work will be beginning soon, while the installation of ductwork and lay-in ceilings continues on the interior. In additiion, construction of the new elevator shaft is complete, with preparations being made for the elevator to be installed later in the project. Since our last update on the Lower Greenville-area townhomes, all four projects have developed a substantially different look and feel as they near completion. At 1831 Bennett, construction is actually complete and the townhouse units are now occupied. At 5719 and 5907 Lindell, both sets of townhomes are rapidly approaching completion with just landscaping, paving work and interior finishes remaining. At 1821 Euclid, the building's exterior is essentially complete and work is centered on interior finish out at this time. McCarthy Architecture wishes you a Merry Christmas and a Happy New Year! McCarthy Architecture is excited to once again be working with Deanan Gourmet Popcorn to expand their current production facility in Wylie. The expansion area consists of a large warehouse area for bagging and shipping, along with a two story office/break area overlooking the production floor. Currently, preparations are being made for the pouring of the slab. We will be sharing more updates as this project progresses along over the coming months. At the Islamic Association of Collin County's campus in Plano, construction on new second floor classrooms is continuing to take shape along both the north and south sides of their facility. At the north side expansion, the shell of the new second floor classrooms is almost complete and the existing first floor classrooms below this area are being prepared to reopen. At the south side, demolition and construction are taking place concurrently with an existing steel roof structure having been removed to allow for the installation of a new floor deck. Now with this floor deck in place, steel has been erected for the new second floor spaces above. In addition, preparations are being made for a new elevator shaft in the southernmost corner of the facility which will be constructed over the next couple of weeks. McCarthy Architecture is excited to be a part of a new expansion and renovation project at the Islamic Association of Collin County in Plano. The project consits of adding new second story classrooms atop existing one story wings to the north and south of the Islamic center's main prayer hall, along with a new elevator and renovations to surrounding spaces. Presently, construction is centered on the north side of the facility, where the existing roof has been removed and steel has been erected for the future classrooms in this area. Ultimately, new walls will be constructed in this area atop existing first floor tilt-wall panels. Over the coming weeks, similar work will be taking place on the south side of the facility. Earlier today, Advantage Academy celebrated the grand reopening of their North Duncanville campus for 4th-8th grade with a luncheon. Headlining the event was Dr. Allen Beck, founder of Eagle Advantage Charter School, who presented a speech and shared stories of the charter school's founding 20 years ago. Today marks the 20th anniversary of the first day of school. We are excited to see the school's new facility in use and the positive contributions which it will make to the overall learning environment. At Advantage Academy's expanded Dallas campus, the focus of construction has shifted significantly since our last update. Construction at new classroom and administration wings is now complete, with progress in the campus' new cafeteria following not far behind. With the school on summer break, work has primarily shifted to an existing classroom wing, where extensive interior and exterior renovation is taking place to integrate the building with the rest of the campus. In addition, site work and landscaping are beginning to take place, including the foundations for seven pillars which represent Advantage Academy's "7 Pillars of a Champion". At the Lower Greenville-area townhomes, construction has continued to move forward since our last update. At both 1831 Bennett and 5719 Lindell, final landscaping is being completed with units in both buildings currently for sale. At 5907 Lindell, exterior materials are being installed and construction is now primarily centered around interior finish-out. At 1821 Euclid, a driveway has been poured and mechanical, electrical and plumbing rough-ins are continuing to take place. Construction is quickly approaching completion for the first phase of Advantage Academy's new Dallas campus expansion and renovation. In new classroom and administration wings, interior finish out is almost complete and the school has begun the process of moving equipment and furnishings into these spaces. Following closely behind is the school's cafeteria area, which will be completed over the coming weeks in preparation for the installation of kitchen equipment and other fixtures. With the school year now complete, construction will now proceed to an additional classroom wing which had been previously used by Advantage Academy and will be renovated over the summer. Last Thursday, First Baptist Wylie celebrated to opening of their new community and education expansion with an open house for the church body. The multifaceted expansion consists of new childrens' and adult education classrooms, new multipurpose spaces, and an enclosed area for a future playground, along with new circulation atriums to improve flow throughout the church campus while also providing much needed space for events. We are excited to see the church make use of this new space! At the Lower Greenville-area townhomes, construction has continued to progress along since our last update. At both 1831 Bennett and 5719 Lindell, construction is almost compelte, with only final exterior/interior work, driveways and landscaping remaining. Work at 5907 Lindell is not far behind, with the installation of exterior finish materials to begin soon. The living units within all three of these projects are currently being offered for sale. At 1821 Euclid, construction is currently centered around the installation of windows and doors along with mechanical, electrical and plumbing rough-ins. At Richardson Bike Mart's new location in McKinney, construction on the new retail space is almost complete. 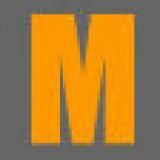 Over the next couple of weeks, Richardson Bike Mart will be moving in fixtures and mercahndise in preparation for their grand opening coming up soon. Announcements and details for the store's opening can be found on their website and facebook page as they are finalized.